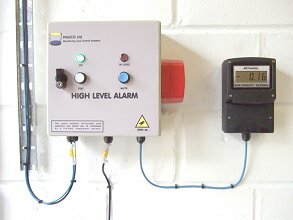 A HITOP 1 - installed as part of a combined system with tank High Level Alarm and contents gauge. 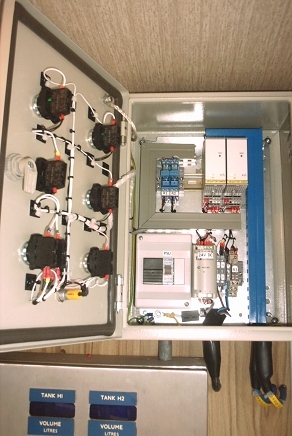 Float operated for applications in clean fuels, chemicals and water based products. Stainless steel, Polypropylene or Nitrile float probes available. 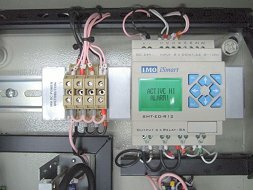 A micro PLC monitors the input for cable breaks and short circuits. For installation by competent Instrument engineers or electricians. An integral “prompt” feature means the system can prompt the user to perform a system test at the start of each month. 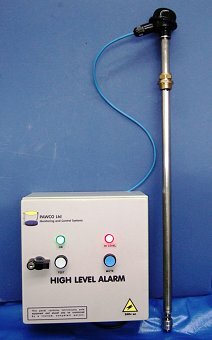 A 700mm long stainless steel probe with float switch. (Options available). Fitted in the top of the tank using a brass or stainless compression fitting, which allows for adjustment of the float height. High intensity LED indicators – No lamps to replace. Short circuit and cable break detection. Output contact for each probe: For remote alarm or valve/pump inhibit. 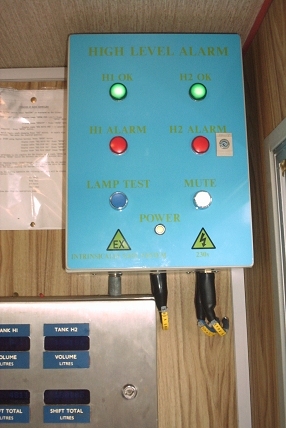 1, 2, 3 and 4 probe units available as standard. 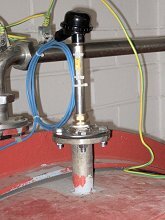 ATEX versions are available for use with probes to be mounted in hazardous areas. Prices start at £539.00 for the basic HITOP 1 system as illustrated above. We recommend .... that float based systems are periodically proved by removing the probe and immersing it in a product sample, as part of a regular preventative maintenance regime. For applications in such products use the tuning fork or capacitance probes offered with our “HITOP +” systems with SIL2 rating for increased reliability. The standard float based system should not be used in products which are likely to cause build up or clogging of the float . 316 stainless steel probe and float. ATEX version is certified to Ex II (1) G D [EEx ia] IIC. Cable restrictions apply, dependent on the application.